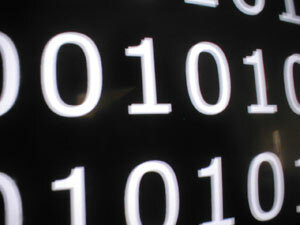 All computers use digital processors that communicate using binary bits. The name 'bit' is an abbreviation of b(inary dig)it. In decimal, each digit can take the values 0 through 9, however a bit is a basic binary value that can only have the value of one or zero. The state of a bit is commonly referred to as being a 1 (ON) or a 0 (OFF). Computers generally use the Byte, which consists of 8 bits for storing data. Using the binary numeral system an 8 bit Byte can hold the values of 0 through 255. Broadband Internet providers market their services in bits per second, not to be confused with Bytes per second. Remember there are eight bits in a Byte. For example a 3 Mbps DSL connection can download at 3 million bits per second or 375 thousand Bytes per second. Most home broadband services are also asymmetric, which simply means that more of the total bandwidth is dedicated to the download channel than to the upload. This is because most home users want to download far more data than they upload. For example you may have an ADSL plan that provides 3 Mbps download speed and 1 Mbps upload speed. While Broadband services are measured in bits, computer files are not. They are measured in Bytes, Kilobytes, Megabytes, etc. To further confuse the issue a Megabyte has two different values depending on the context. For example computer hard drives are marketed using decimal values. A 500 MB drive can hold 500 million Bytes, however when you look at the size in Windows you will see 476.8 MB. This is due to the fact that the computer uses binary values such as 1024 for 1 Kilobyte, then 1024 Kilobytes for 1 Megabyte and 1024 Megabytes for 1 Gigabyte. How long will it take to download 3.4 Gigabytes using your 3 Mbps DSL connection? A good rule of thumb is to allow at least 25% for overhead in the transfer. You need to download a 3.4 GB file from the Internet. Your 3 Mbps DSL connection can download 3,000,000 Bits per second. If you divide 29,208,000,000 by 3,000,000 you get 9736 seconds. It will take approximately 3 Hours and 23 Minutes to complete your 3.4 GB download using a 3 Mbps DSL Internet connection. *Note: These are average sizes. Exact file size will vary considerably depending on the specific content of your files. *Note: Broadband delivery technologies encompass a wide range of speeds. PDF - Bits, Bytes and Internet Speeds. A network connection always negotiates to the speed of the slowest device. Using cabled Ethernet, many routers, switches, game consoles are limited by the speed of the network ports, typically 100 Mbps (Fast Ethernet). To exceed 100 Mbps would require all devices and cables to be Gigabit (1000 Mbps). Remember that your Internet connection is shared, so all devices will share the limited bandwidth from the ISP. For gaming your speeds are more than adequate. You also need to know the latency (ping time) to the gaming server. Latency is the time in Milliseconds that it takes the signal to travel to the destination server and back. Shoot for something under 50 ms. Over 100 ms will cause lag. Dan, you are a master of logic, you’ve written a masterful article. Though you don’t say it, I assume there is great significance between a capital ‘B’ and a lower case ‘b’ as in MBps vs Mbps. Where can I read more of your stuff. Compare Low Cost Broadband Providers. Find the Cheapest Broadband Internet Service Plan Priced Within Your Budget. You'll Get Blazing Fast High Speed Internet for the Lowest Possible Cost!